Image from the February 1912 issue of Pictorial Review, courtesy of the Old Design Shop, a vintage image treasury. dressed up with haricot beans. more interested in other messes. I cook a great deal from scratch; partially because I have the time, mostly because it’s an attempt to stretch my budget. 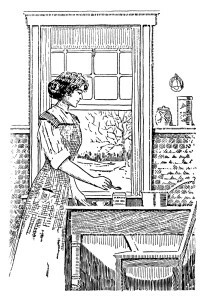 In autumn and winter, soup-making is a regular activity. Last winter (2013/2014), all my soups were restricted to three items from the grocery aisle, and cooked up with either red or brown lentils. This year I have discovered the mixed veg. packets at budget retailers, so I have broadened my ingredients list. Whatever the concoction that results, half is put aside for the freezer. This way I have a couple of flavours on rotation. Chopping or grating vegetables for soup is both a mindless and thought-encouraging activity. I’ll think about things in my life, and I’ll think about nothing except scooping up the peelings for the bin. The other satisfying bonus of soup is that you can leave it to simmer while you continue with other tasks, like writing. Today’s poem is a response to “In this place, I eat butternut soup,” written in 2012. You are astute readers, so there is no need for me to hammer home the points of contrast between the two poems. If you would like to share your own observations, please do so in the comments. I would be interested to read them.